It’s been a long few weeks here at KatersAcres … but good weeks! I spent the last week on vacation with my hubby visiting family, so most of these photos are actually from the week prior. It’s hard to clay on vacation, even though I really wanted to. Butterfly Wings! It’s that time of year, spring! Every spring I get so excited that I make flower canes, butterfly canes, & petals canes to suit my flower desires. Get the tutorial for my butterfly wing cane here. I’m still in love with Skinner Blends and photograph almost all of the ones that I make in my studio, especially the pretty ones! Speaking of flower & petal canes, here’s a snapshot of my petal & leaf cane box … isn’t it pretty?! My new Butterfly Dragons are ready for adoption on Etsy. I had a lot of fun making these little boys! The final three pictures are from my lily cane that I made. I love lily’s. I know there will be more lily’s to come! Daily, I’m inspired by the artwork of other polymer clay artists. Be sure to visit my FaceBook page and join me as we find new & amazing artwork. Ginger Davis Allman of The Blue Bottle Tree recently shared some DIY mini-cutters on her website. Don’t miss it! Go there now. There’s lots of new exciting things going on at the Polymer Clay Adventure. Awesome new tutorial from Layl McDill featuring a cat cane is really cool. Please feel free to join us here. The 2015 Polymer Clay Challenge (#2015PCChallenge) is going very well and if you’re not participating you are missing out on all the fun. Be sure to come & join us. I’m working up a HUGE workshop … details will come later. You won’t want to miss this. Be sure you are SIGNED UP (sign up in the box at the top right of the page) for my email to get first dibs & early bird pricing. Seats are limited. Hubby & I went for a little vacation last week. It was so nice to get away with him and visit family! My puppy, Mocha Latte, had surgery this past week. She’s so cute when she’s not feeling well. It’s some mighty nice weather here (about 60 degrees) so this week we opened up the grill and had our first of many dinners on the porch! 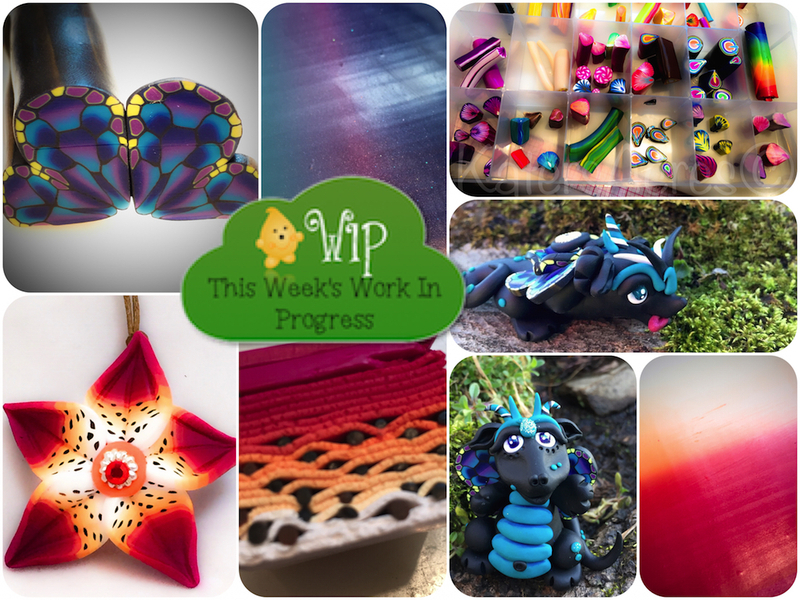 Want to be an artist of inspiration for the week? Every week I choose 1-2 artists whose work has caught my eye during the week. How do you catch my eye? It’s simple … use social media. Here’s a few easy ways to catch my attention: become part of FaceBook groups I am also on, showcase your work on your FaceBook page, Twitter, Instagram, Flickr, Pinterest, or even tag me @KatersAcres in your photos on FaceBook.